The purpose of the Earthquake Engineering Implementation Interface is to create and maintain collaborations with research and practicing engineers, much as the Seismic Hazard and Risk Analysis focus group did during SCEC3. These activities may include ground motion simulation validation, rupture-to-rafters simulations of building response as well as the end-to-end analysis of large-scale, distributed risk (e.g., ShakeOut-type scenarios). Our goal of impacting engineering practice and large-scale risk assessments requires even broader partnerships with the engineering and risk-modeling communities, which motivates the activities described next. A TAG focused on validation of ground motion simulations for use in engineering applications is developing and implementing testing/rating methodologies, via collaboration between ground motion modelers and engineering users. The workshops and research of this TAG to date have identified the efforts below as potential priority activities in this area. See the Ground-Motion Prediction (GMP) and the Community Modeling Environment (CME) sections of the Collaboration Plan for related research priorities. Proposals on these topics will be reviewed with all other SCEC proposals in January of 2016. Interested researchers are invited to visit the GMSV TAG wiki (http://collaborate.scec.org/gmsv/) and contact Dr. Nicolas Luco (nluco@usgs.gov) and Dr. Sanaz Rezaeian (srezaeian@usgs.gov) to discuss opportunities for coordinated research. Note that any PIs funded to work on GMSV-related projects will become members of the TAG and will be required to coordinate with each other, in part via participation in monthly conference calls and annual workshops/meetings. Develop validation methodologies that use relatively simple metrics (e.g., significant duration), and demonstrate them with existing simulated ground motions and their recorded counterparts. Such research must be coordinated with the Broadband Platform Validation Project. Develop validated and efficient methods for either i) adjusting ground motion time series simulated by the SCEC Broadband Platform to account for the local site conditions at historical earthquake stations; or ii) de-convolving recorded ground motion time series to a reference site condition corresponding to that for simulated ground motions. Develop and demonstrate validation methodologies that use common models of structures of interest (e.g. multi-degree-of-freedom nonlinear models of building or geotechnical systems) for particular engineering applications. Such research must be coordinated with the validation efforts of the Software Environment for Integrated Seismic Modeling (SEISM) project. Develop and demonstrate validation methodologies for the use of CyberShake ground motion simulations in developing probabilistic and deterministic hazard maps for building codes and other engineering applications. In particular, investigations of observed versus simulated region-specific path effects for small-magnitude earthquakes in Southern California are encouraged. Such research must be coordinated with the Committee for Utilization of Ground Motion Simulations (UGMS). Research important ground motion or structural (e.g. building or geotechnical system) response parameters and statistics that should be used in validation of simulations. Demonstrate similarities and differences between otherwise parallel validation tests/ratings using these ground motion or structural response parameters. Demonstrate validation methodologies with ground motions simulated with deterministic and stochastic methods above 1 Hz. Improve ground motion simulations by closely collaborating with modelers on iterative applications of validation methodologies. Develop improved hazard models that consider simulation-based earthquake source and wave propagation effects that are not already well reflected in observed data. These could include improved methods for incorporating rupture directivity effects, basin effects, and site effects in the USGS ground motion maps, for example. The improved models should be incorporated into OpenSHA. Use broadband strong motion simulations, possibly in conjunction with recorded ground motions, to develop ground motion prediction models (or attenuation relations). Broadband simulation methods must be verified (by comparison with simple test case results) and validated (against recorded strong ground motions) before use in model development. The verification, validation, and application of simulation methods must be done on the SCEC Broadband Simulation Platform. Such developments will contribute to the future NGA-H Project. Investigate bounds on the median and variability of ground motions for a given earthquake scenario. Develop acceptance criteria for simulated ground motion time histories to be used in structural response analyses for building code applications or risk analysis. This relates closely to the GMSV section above. Assess the advantages and disadvantages of using simulated time histories in place of recorded time histories as they relate to the selection, scaling and/or modification of ground motions for building code applications or risk analysis. Develop and validate modules for simulation of short period ground motions (< 1 sec) for incorporation in the SCEC Broadband Platform. Develop and validate modules for the broadband simulation of ground motion time histories close to large earthquakes, and for earthquakes in the central and eastern United States, for incorporation in the SCEC Broadband Platform. Develop and validate modules for nonlinear site response, including criteria for determining circumstances under which nonlinear modeling is required. Incorporate the modules into the SCEC Broadband Platform. Compare simulated versus recorded ground motions for different models of the regional geologic structure. Infrastructure Systems. Assess the performance of distributed infrastructure systems (e.g., water, electrical and transportation) using simulated ground motions. Evaluate the potential impact of basin effects, rupture directivity, spatial distribution of ground motion, or other phenomena on risk to infrastructure systems. Tall Buildings and Other Long-Period Structures. Enhance the reliability of simulations of long period ground motions in the Los Angeles region using refinements in source characterization and seismic velocity models, and evaluate the impacts of these ground motions on tall buildings and other long-period structures (e.g., bridges, waterfront structures). End-to-End Simulation. Interactively identify the sensitivity of structural response to ground motion parameters and structural parameters through end-to-end simulation. Buildings of particular interest include non-ductile concrete frame buildings. Reference Buildings and Bridges. Participate with PEER investigators in the analysis of reference buildings and bridges using simulated broadband ground motion time histories. The ground motions of large, rare earthquakes, which are poorly represented in the NGA strong motion database, are of special interest. Coordination with PEER can be done through Yousef Bozorgnia (yousef@berkeley.edu). Earthquake Scenarios. Perform detailed assessments of the results of scenarios such as the ShakeOut exercise, and the scenarios for which ground motions were generated for the Tall Buildings Initiative (including events on the Puente Hills, Southern San Andreas, Northern San Andreas and Hayward faults) as they relate to the relationship between ground motion characteristics and structural response and damage. Investigate the relationship between input ground motion characteristics and local soil nonlinear response, liquefaction, lateral spreading, local soil failure, and landslides -- i.e., geotechnical hazards. Investigate hazards due to surface faulting and to surface deformation caused by subsurface faulting and folding. Develop improved site/facility-specific and portfolio/regional risk analysis (or loss estimation) techniques and tools, and incorporate them into the OpenRisk software. Use risk analysis software to identify earthquake source and ground motion characteristics that control damage estimates. Proposals for other innovative projects that would further implement SCEC information and techniques in seismic hazard, earthquake engineering, risk analysis, and ultimately loss mitigation, are encouraged. The implementation of SCEC research for practical purposes depends on interactions with engineering researchers and organizations, and with practicing engineers, building officials, insurers, emergency managers, and other technical users of our information. An important area of EEII work is in the validation and utilization of ground motion simulations. With the important milestone of completion of the BroadBand Platform validation, there is now significant data and computational infrastructure that is being utilized in this area. Figure 1. Observed and simulated ground motions with median levels of directional polarization in elastic oscillator response. 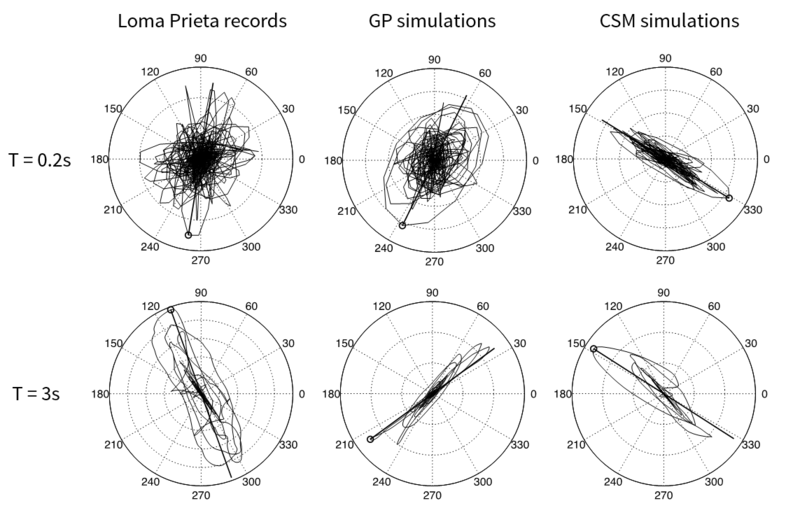 GP = Graves and Pitarka simulation algorithm, CSM = Composite Source Model simulation algorithm (from Burks and Baker, 2014). Deviation in polarization, relative to expected levels observed in recordings, is a simulation validation metric that has been implemented on the BroadBand Platform. Following several years of work by SCEC researchers to develop and evaluate metrics for validating ground motion simulations, a committee has been formed and work is underway to implement the most useful or promising metrics on the SCEC BroadBand Platform. These new calculation tools enable users of the Platform to compute these metrics automatically while simulating ground motions. These features are intended to enable engineers or ground motion simulators to validate simulations easily via standardized procedures, as has successfully been achieved previously for response spectral metrics. A Technical Activity Group (TAG) has been working for several years to develop and implement testing/rating methods for simulations that resulted from collaboration between ground motion modelers and engineering users. The GMSV activity was undertaken in concert with the BBP for developing simulations that reproduced the GMPE’s, which were based on elastic response spectra associated with single degree of freedom oscillators. The GMSV was focused on how simulations could be used in probabilistic seismic hazard analysis (PSHA), structural nonlinear response history analysis, and geotechnical site response analysis. Validating (as opposed to verifying) simulation algorithms was a daunting task, as the simulations of greatest interest are those from conditions that have not been well observed (e.g., motions a short distances from large magnitude earthquakes)—so how can one rigorously evaluate whether such simulations are valid? The work required specifying application areas, and then developing “Validation gauntlets” that simulated motions should pass in order to be deemed reasonable. Gauntlets have been evaluated for single-degree-of-freedom oscillators, simple multi-degree-of freedom oscillators and geotechnical systems, used as proxies for more complex structural and geotechnical systems. For example, how can simulations be used in the analysis of structural nonlinear response history for 3D multi-degree-of-freedom buildings? Will the simulations have the temporal behavior and frequency content to produce the response of structures up to and beyond their elastic limit? Can simulations be used in the geotechnical analysis of slope displacements and soil liquefaction, both of which are duration sensitive? These projects are demanding that simulations do more than produce an elastic response spectrum; the simulations have to have the duration and frequency content that are observed from data. Figure 2. Example Los Angeles Region Hazard Map, 2% in 50-yr Sa(3 sec) (Graves et al. 2010). 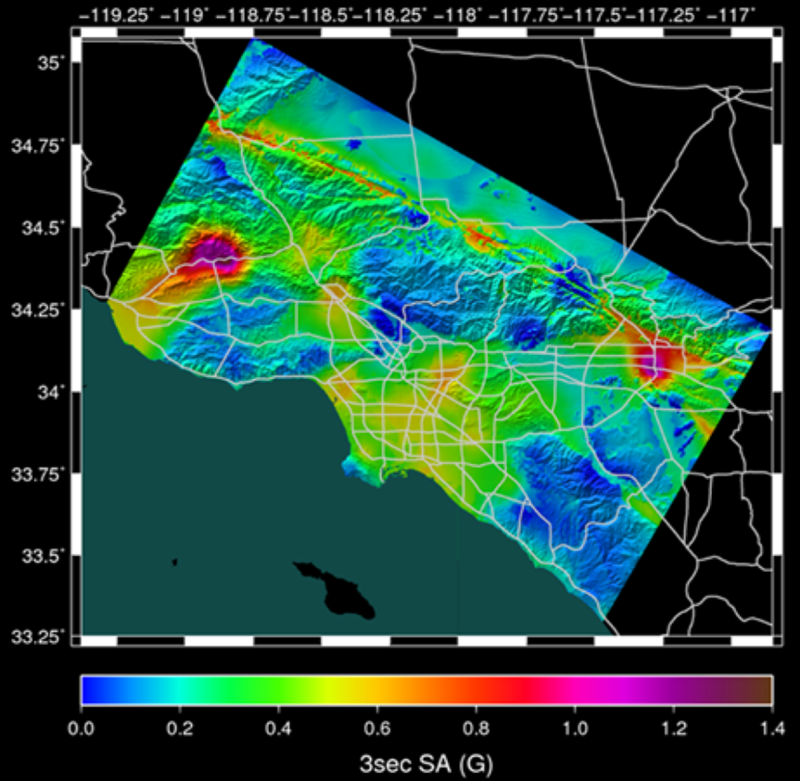 The Committee for Utilization of Ground Motion Simulations has been working toward the goal of utilization of ground-motion simulations to develop long period spectral acceleration maps for the Los Angeles region. The objective is to utilize the CyberShake platform to compute seismic hazard at long periods, and produce maps that are compatible with, though supercede, traditional empirical maps. The maps could then be adopted in the America Society of Civil Engineers 7-21 Standard, which will be released in 2021 and govern earthquake-resistant design requirements in the United States. By integrating the full suite of earthquakes and ground motions, CyberShake provides a numerically based seismic hazard map for the Los Angeles area. Because CyberShake can account for the 3D velocity structure, including basins, it provides much greater refinement than the current state-of-the-art seismic hazard analysis based on empirical ground motion prediction equations that have limited ability to capture basin effects. In essence, CyberShake provides a means for producing urban seismic hazard maps. As can be imagined, this effort requires considerable expense in computational resources. At the same time it integrates many of SCEC’s collaborative efforts: the community fault model, the community velocity model, the Broadband Platform for a product that is directly useful to the engineering community, emergency planners and political entities responsible for the safety of the greater Los Angeles metropolitan area. This committee is using SCEC science to guide engineering regulations, while enabling the detailed oversight and consensus-building associated with building code development.